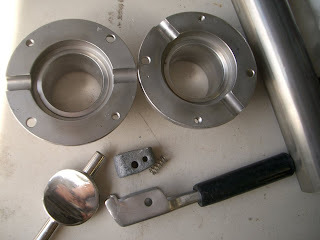 I am preparing to build a stainless steel beer-brewing tank. In preparation, I've been buying various stainless valves and tubes from eBay. 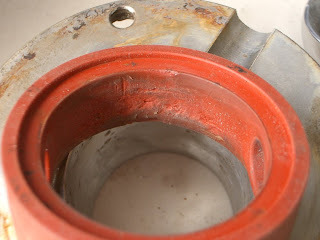 The bottom of the brew-tank needs a large valve -- preferably a butterfly valve. I found one on eBay for less than $20 shipped. The seller said it was a "great valve". As it turned out, the only thing great about it was the price. This thing has had a very hard life. Luckily, there is nothing missing, and all of the pieces are in fair shape except for the rubber seal. Not only does the seal look bad, but it smells bad too. It has a strange sweet smell like antifreeze. I don't want my beer touching this thing even if it didn't leak. I decided to make a replacement since there is no manufacturer listed on the valve and buying a replacement seemed like a long-shot. 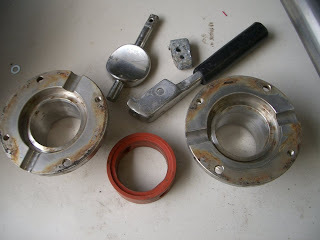 First, I sandblasted the metal parts. It's mostly OK, but there is some pitting. It may not cause any leaks. I have some Dow MDX4-4210 "biomedical" elastomer left over from a work project. This stuff is basically liquid silicone that, when mixed with a catalyst, cures into a solid piece. The cure time is almost a day at room temperature, but only a couple hours at 130*F.
I machined a two-part mold out of 1" thick aluminum. After mixing the silicone and catalyst, there are thousands of trapped air bubbles in the mixture. This will create a part that is more like a sponge than a solid piece of rubber. The product information sheet suggested de-gassing the mixed silicone in a vacuum chamber for 30 minutes, which is what I did. It works great, and the cure time is so long at room temperature, there is no danger of running out of "pot life". 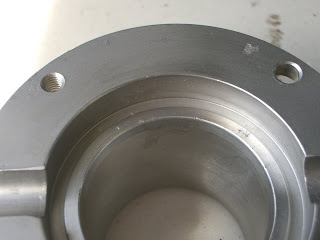 I used a custom-made punch to cut the shaft holes after the piece was cured and removed from the mold. The replacement seal is a lot softer than the original. I don't know if/how that would affect the valve's operation. I'll probably test this valve before I weld it onto the brew tank.